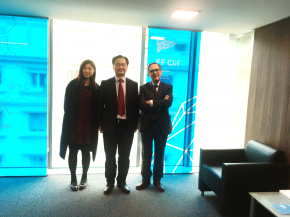 May 01th 2018 New visiting researcher at the EF Clif Dr Wenyi Gu, medical investigator working on the group of Dr Hai Li in Shanghai, is spending three months at the EF Clif central headquarters in Barcelona. Dr Wenji Gu is a medical investigator, currently finishing her Master at the Department of Gastroenterology in Ren Ji Hospital, School of Medicine, and at Key Laboratory of Gastroenterology & Hepatology in Shanghai Jiao Tong University. 1. Describe the epidemiology of ACLF in China. 2. Establish diagnostic criteria for Chinese ACLF patients with HBV to determine whether there are universally accepted diagnostic criteria for both Eastern and Western types of the disease. 3. Explore the clinical course of ACLF patients, quantify the severity of the disease and establish a prognosis model for both ACLF patients and AD patients. She will spend 3 months in our offices in Barcelona to extend her expertise on the Acute-on-Chronic Liver Failure Syndrome under the direction of Prof Vicente Arroyo, which will help her to finish some of her studies already initiated at the Shanghai Jiao Tong University. These studies aim at improving early recognition of ACLF patients characterized by high short-term mortality, and eventually halting such epidemic. The EF Clif wants to enhance the collaboration between different study groups and share its expertise. This experience is only the first of many, as we are sure that it will contribute to the pivotal role of the Foundation in the advancement of research in decompensated cirrhosis by strengthening ties between the international community.